Oral anticoagulation is mandatory for patients at high risk of thromboembolism, but the risk of bleeding should also be taken into account. Direct oral anticoagulants are now recommended for non-valvular AF as a potential alternative to warfarin. In this article we discuss methods to assess the anticoagulant effect of these agents, specific and general antidotes, and management of complications such as embolic and haemorrhagic stroke, and significant bleeding. Arrhythmia & Electrophysiology Review 2017;6(4):167–78. Specific antidotes are under study.30,31 Idarucizumab, a monoclonal antibody fragment, completely reverses the anticoagulant effect of dabigatran within minutes and has been shown to be effective in initial clinical trials (2.5 g IV infusions no more than 15 min apart).32–34 In patients with acute major bleeding the reported efficacy was 71 %, with 10 % thrombotic events, and a mortality of 12 %.32 Idarucizumab for reversal of dabigatran was approved by the FDA in October 2015. Ciraparantag binds in a similar way to the new oral factor Xa inhibitors, and to dabigatran, but further clinical experience is needed. Andexanet alfa, a recombinant protein that binds and sequesters factor Xa inhibitors has been successfully tried for apixaban and rivaroxaban (ANNEXA trials).37,38 It is given as 300 mg IV bolus that can be followed by an infusion of 4mg/min for 120 min. In patients with acute major bleeding the reported efficacy was 79 %, with 18 % thrombotic events, and a mortality of 15 % reported.38 Ciraparantag, (IV bolus of 100–300 mg), a synthetic molecule that binds specifically to unfractionated heparin and low-molecular-weight heparin, reversed edoxaban within 10–30 min,39 and is under study. Patients presenting within 4.5 h after the onset of ischaemic stroke should be considered for IV rt-PA (0.9 mg/kg, with 10 % bolus, and the remainder over 60 min, maximum dose 90 mg). Diffusion-weighted magnetic resonance imaging and non-enhanced computed tomography are the most sensitive and specific methods for detecting ischaemic stroke and excluding intracerebral haemorrhage.40 They are necessary before intravenous rtPA to exclude intracranial haemorrhage (absolute contraindication) and to determine whether CT hypodensity of haemorrhage or MRI hyperintensity of ischaemia are present. Anticoagulation does not increase the risk of intracerebral haemorrhagic complications when INR is ≤1.7.41 In patients who present with stroke while taking new anticoagulants, if the aPTT is prolonged in a patient taking dabigatran or the prothrombin time with an Xa inhibitor, it should be assumed that the patient is anticoagulated, and thrombolysis should probably not be administered.40 However, in recent studies on patients with a ischaemic stroke and a NOAC taken within the last 48 h, thrombolysis with rt-PA or intra-arterial treatment had similar risk of symptomatic intracranial haemorrhage to that in patients on subtherapeutic VKA treatment (INR <1.7) or in those without previous anticoagulation.42,43 Criteria for fibrinolysis are presented in Table 3 and recommendations for secondary stroke prevention in Table 4 and Figure 1. Of note, age >80 years is not an exclusion criterion, provided it can be given within the first 3 h. Tenecteplase (0.25 mg/kg, administered as a single bolus, with a maximum dose of 25 mg), a more fibrin-selective agent, is superior to alteplase in patients subjected to fibrinolysis within 6 h after the onset of ischaemic stroke,44 but this was not verified in another comparison within 4.5 h after stroke.45 Anticoagulants and antiplatelet agents should be withheld the first 24 h following fibrinolysis. Labetalol (10–20 mg IV over 1–2 min, may repeat 1 time), or nicardipine (5 mg/h IV, titrate up by 2.5 mg/h every 5–15 min, maximum 15 mg/h) are recommended only when the blood pressure exceeds 180/110 mmHg.40 However, in patients who are not candidates for fibrinolysis, blood pressure lowering in acute stroke is not established to be useful with systolic blood pressure of 140 to 220 mmHg and without evidence of nonstroke end-organ damage, with the possible exception of an early (<6 h) BP lowering strategy.46 Thus, treatment of hypertension in this setting should be individualised. In patients who are candidates for fibrinolysis a pre-treatment BP <180/110 mmHg is mandatory. Fibrinolysis offers recanalisation rate of <50 %, and large thrombi in vessels such as the distal internal carotid artery or the first segment of the middle cerebral artery respond poorly.47 Intra-arterial, catheter-based treatment administered within 6 h after acute ischaemic stroke using aspiration and stent retrievers has improved neurologic recovery, and reduced mortality compared to IV fibrinolysis, especially in the presence of a proximal cerebral arterial occlusion, and a small infarct or salvageable brain tissue on CT.48 It can be delivered with or without concomitant IV fibrinolysis, and preliminary data suggest that they might be useful up to 8 h49 or even 12 h50 after symptoms onset. Antidotes and general measures as discussed, are summarised in Table 5 and Figure 3. Recent data suggest that anticoagulation should be restarted following discharge after an episode of GI bleeding.62 However, this study was too small for definitive conclusions. Usually major surgical procedures require an INR of at least <1.5. Warfarin has a half-life of 36–42 h and should be stopped for 3–4 days before surgery when the INR is <2 and 5 days when it is >2 (Figure 4).63 In urgent cases oral or IV vitamin K (1–2 mg) may be considered. In need of urgent reversal, prothrombin plasma concentrate may also be added, and is preferable to fresh frozen plasma.64 Bridging to UFH or LMWH that is discontinued ≥12 h before and restarted 24 h after the operation, has been recommended only in patients with certain mechanical heart valves and high risk of thrombosis (Figure 5 and Table 6). In a recent meta-analysis, however, heparin bridging for invasive procedures and surgery in patients receiving vitamin K antagonists for AF, prosthetic heart valves, or VTE conferred a greater than five-fold increased risk for bleeding, whereas the risk of thromboembolic events was not significantly different between bridged and non-bridged patients.65 The use of therapeutic dose LMWH was associated with an increased risk of bleeding compared with prophylactic or intermediate dose.65 Thus, bridging is not required, especially in patients at low risk of thrombosis.66–68 In the continued-warfarin group, the INR in the day of surgery should be ≤3, except for patients with one or more mechanical valves, for whom an INR ≤3.5 or less is permitted (Bridge or Continue Coumadin for Device Surgery Randomised Controlled Trial [BRUISECONTROL] trial).67 In patients with AF, normal renal function and platelet count platelet count >100 × 109/L, even major surgery can be safely accomplished with warfarin cessation without bridging when the INR is <1.8 (Effectiveness of Bridging Anticoagulation for Surgery [BRIDGE] trial). Warfarin is then resumed the evening after the procedure.68 There are limited data on safety of cardiac surgery or other major surgery with a very high risk of thromboembolism and bleeding, in patients who are on warfarin. Currently, these patients are bridged with heparin prior to surgery. In the need of emergent coronary artery bypass grafting (CABG), fresh frozen plasma and vitamin K may be used to reduce the risk of bleeding. Patients on anticoagulation for atrial fibrillation are still at risk of ischaemic stroke, and may also develop haemorrhagic complications. Prompt diagnosis and therapy is necessary for these conditions. Specific antidotes are now available for the new, direct oral anticoagulants. Piccini JP, et al. Clinical course of atrial fibrillation in older adults: the importance of cardiovascular events beyond stroke. Eur Heart J 2014;35:250–6. Santangeli P, et al. Atrial fibrillation and the risk of incident dementia: a meta-analysis. Heart Rhythm. 2012;9:1761-8. Sposato LA, et al. Diagnosis of atrial fibrillation after stroke and transient ischaemic attack: a systematic review and meta-analysis. Lancet Neurol 2015;14:377–87. Lubitz SA, et al. Genetic risk prediction of atrial fibrillation. Circulation 2016. 135;14:1311-20. Wolf PA, et al. Atrial fibrillation as an independent risk factor for stroke: the Framingham Study. Stroke 1991;22:983–8. Quinn GR, et al. Wide variation in reported rates of stroke across cohorts of patients with atrial fibrillation. Circulation 2016. Christiansen CB, et al. Atrial fibrillation and risk of stroke: a nationwide cohort study. Europace 2016;18:1689–97. Freedman B, et al. Screening for atrial fibrillation: A Report of the AF-SCREEN International Collaboration. Circulation 2017;135:1851–67. Yiin GS, et al. Age-specific incidence, outcome, cost, and projected future burden of atrial fibrillation-related embolic vascular events: a population-based study. Circulation 2014;130:1236–44. Bekwelem W, et al. Extracranial systemic embolic events in patients with nonvalvular atrial fibrillation: incidence, risk factors, and outcomes. Circulation 2015;132:796–803. Soliman EZ, et al. Atrial fibrillation and risk of ST-segment-elevation versus non-ST-Segment-elevation myocardial infarction: the Atherosclerosis Risk in Communities (ARIC) Study. Circulation 2015;131:1843–50. Shibata T, et al. Prevalence, clinical features, and prognosis of acute myocardial infarction attributable to coronary artery embolism. Circulation 2015;132:241–50. Roldan V, et al. Predictive value of the HAS-BLED and ATRIA bleeding scores for the risk of serious bleeding in a “real-world” population with atrial fibrillation receiving anticoagulant therapy. Chest 2013;143:179–84. O’Brien EC, et al. The ORBIT bleeding score: a simple bedside score to assess bleeding risk in atrial fibrillation. Eur Heart J 2015;36:3258–64. Lip GY. How to manage occult atrial fibrillation detected on long-term monitoring. Circulation 2016;133:1290–95. Friberg L, et al. Benefit of anticoagulation unlikely in patients with atrial fibrillation and a CHA2DS2-VASc score of 1. J Am Coll Cardiol 2015;65:225–32. Lip GY, et al. Oral anticoagulation, aspirin, or no therapy in patients with nonvalvular AF with 0 or 1 stroke risk factor based on the CHA2DS2-VASc score. J Am Coll Cardiol 2015;65:1385–94. Lip GY, et al. Stroke prevention in atrial fibrillation: a systematic review. JAMA 2015;313:1950–62. Andreotti F, et al. Antithrombotic therapy in the elderly: expert position paper of the European Society of Cardiology Working Group on Thrombosis. Eur Heart J 2015;36:3238-3249. Kovacs RJ, et al. 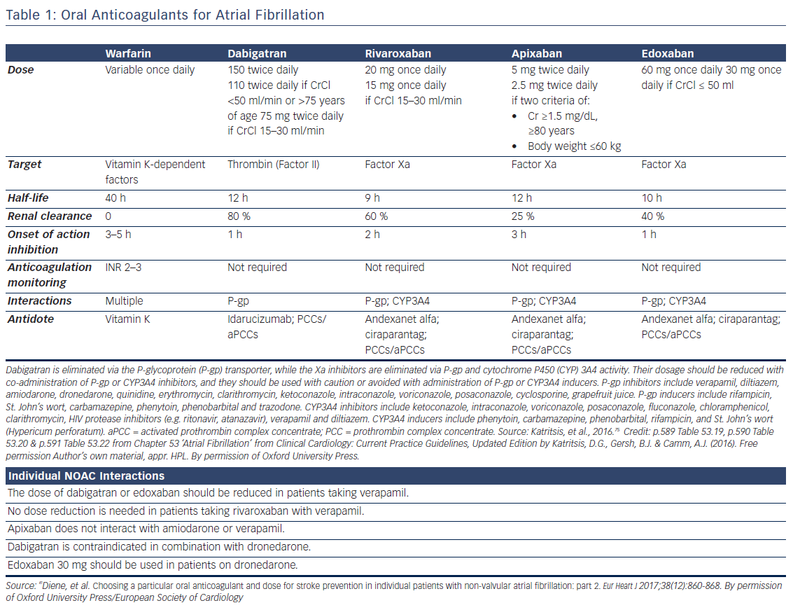 Practical management of anticoagulation in patients with atrial fibrillation. J Am Coll Cardiol 2015;65:1340–60. Connolly SJ, et al. 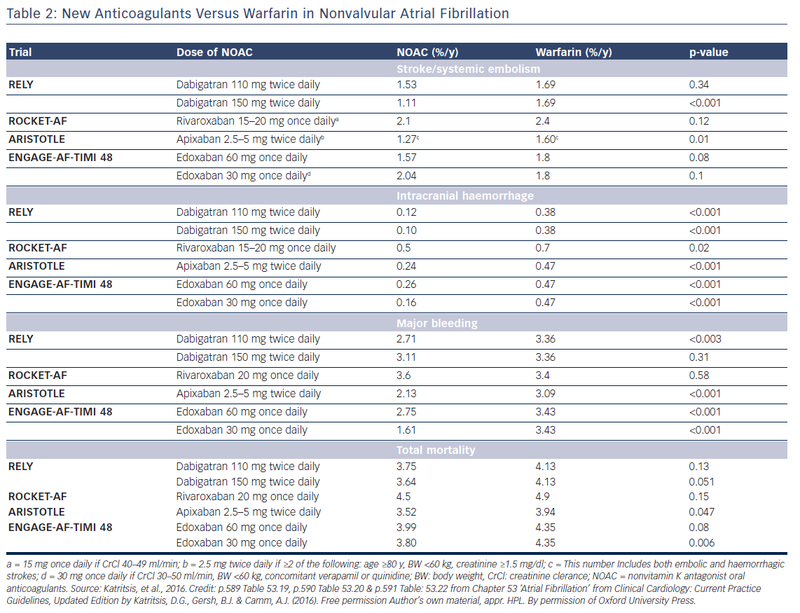 Benefit of oral anticoagulant over antiplatelet therapy in atrial fibrillation depends on the quality of international normalized ratio control achieved by centers and countries as measured by time in therapeutic range. Circulation 2008;118:2029–37. Apostolakis S, et al. Factors affecting quality of anticoagulation control among patients with atrial fibrillation on warfarin: the SAMe-TT(2)R(2) score. Chest 2013;144:1555–63. Guyatt GH, et al. Executive summary: Antithrombotic Therapy and Prevention of Thrombosis, 9th ed: American College of Chest Physicians Evidence-Based Clinical Practice Guidelines. Chest 2012;141:7S–47S. Garcia DA, et al. Reversal of warfarin: case-based practice recommendations. Circulation 2012;125:2944–7. Sarode R, et al. Efficacy and safety of a 4-factor prothrombin complex concentrate in patients on vitamin K antagonists presenting with major bleeding: a randomized, plasma-controlled, phase IIIb study. Circulation 2013;128:1234–43. Holbrook A, et al. Evidence-based management of anticoagulant therapy: Antithrombotic Therapy and Prevention of Thrombosis, 9th ed: American College of Chest Physicians Evidence-Based Clinical Practice Guidelines. Chest 2012;141:e152S–184S. Weitz JI, et al. Urgent need to measure effects of direct oral anticoagulants. Circulation 2016;134:186–8. Cuker A, et al. Laboratory measurement of the anticoagulant activity of the non-vitamin K oral anticoagulants. J Am Coll Cardiol 2014;64:1128–39. Verheugt FW, et al. 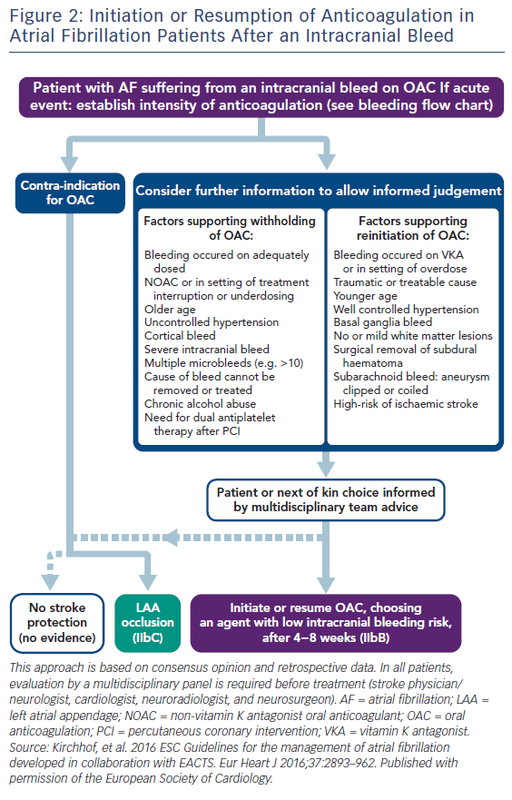 Oral anticoagulants for stroke prevention in atrial fibrillation: current status, special situations, and unmet needs. Lancet 2015;386:303–10. Enriquez A, et al. Anticoagulation reversal in the era of the non-vitamin K oral anticoagulants. Europace 2016;18:955–64. Niessner A, et al. Reversal strategies for non-vitamin K antagonist oral anticoagulants: a critical appraisal of available evidence and recommendations for clinical management—a joint position paper of the European Society of Cardiology Working Group on Cardiovascular Pharmacotherapy and European Society of Cardiology Working Group on Thrombosis. Eur Heart J 2017;38:1710–6. Pollack CV, Jr., et al. Idarucizumab for dabigatran reversal. N Engl J Med 2015;373:511–20. Glund S, et al. Safety, tolerability, and efficacy of idarucizumab for the reversal of the anticoagulant effect of dabigatran in healthy male volunteers: a randomised, placebo-controlled, double-blind phase 1 trial. Lancet 2015;386:680–90. Eikelboom JW, et al. Idarucizumab: The antidote for reversal of dabigatran. Circulation 2015;132:2412–22. Ruff CT, et al. 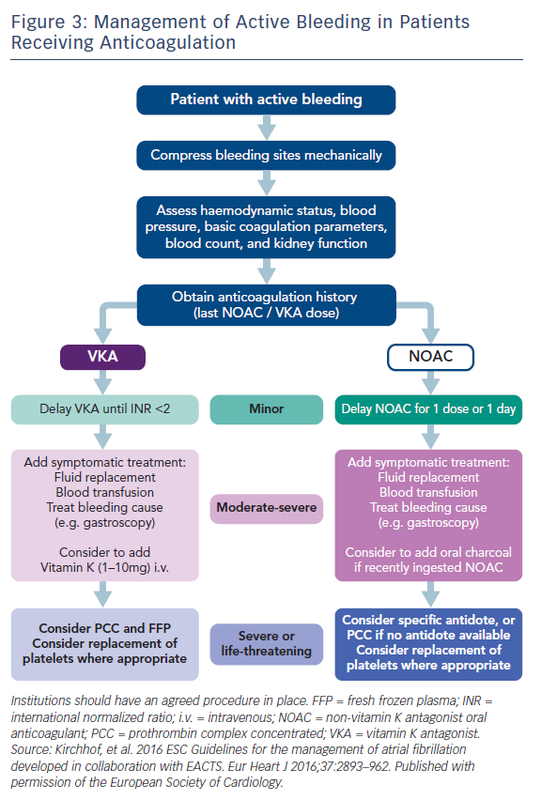 Management of bleeding with non-vitamin k antagonist oral anticoagulants in the era of specific reversal agents. Circulation 2016;134:248–61. Siegal DM, et al. 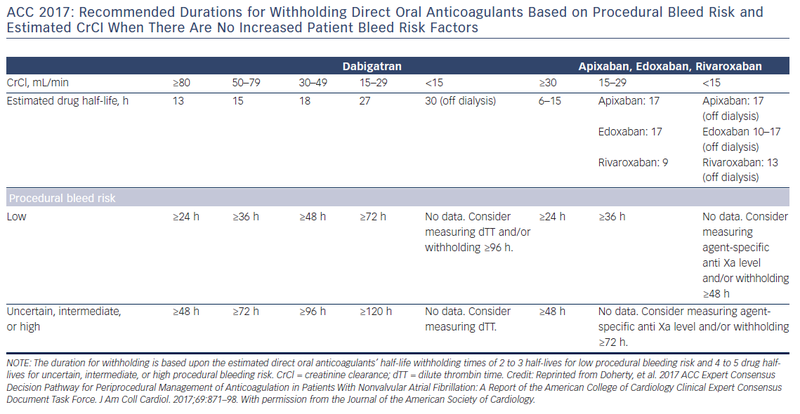 Acute management of bleeding in patients on novel oral anticoagulants. Eur Heart J 2013;34:489–98b. Siegal DM, et al. Andexanet alfa for the reversal of factor Xa inhibitor activity. N Engl J Med 2015;373:2413–24. Connolly SJ, et al. Andexanet alfa for acute major bleeding associated with factor Xa inhibitors. N Engl J Med 2016;375:1131–41. Ansell JE, et al. Use of PER977 to reverse the anticoagulant effect of edoxaban. N Engl J Med 2014;371:2141–2. Jauch EC, et al. Guidelines for the early management of patients with acute ischemic stroke: a guideline for healthcare professionals from the American Heart Association/American Stroke Association. Stroke 2013;44:870–947. Diener HC, et al. Choosing a particular oral anticoagulant and dose for stroke prevention in individual patients with non-valvular atrial fibrillation: part 2. Eur Heart J 2016. epub ahead of press. Seiffge DJ, et al. Recanalization therapies in acute ischemic stroke patients: impact of prior treatment with novel oral anticoagulants on bleeding complications and outcome. Circulation 2015;132:1261–9. Xian Y, et al. Use of intravenous recombinant tissue plasminogen activator in patients with acute ischemic stroke who take non-vitamin K antagonist oral anticoagulants before stroke. Circulation 2017;135:1024–35. Parsons M, et al. A randomized trial of tenecteplase versus alteplase for acute ischemic stroke. N Engl J Med 2012;366:1099–1107. Huang X, et al. Alteplase versus tenecteplase for thrombolysis after ischaemic stroke (ATTEST): a phase 2, randomised, open-label, blinded endpoint study. Lancet Neurol 2015;14:368–76. Enos Trial Investigators, et al. Efficacy of nitric oxide, with or without continuing antihypertensive treatment, for management of high blood pressure in acute stroke (ENOS): a partial-factorial randomised controlled trial. Lancet 2015;385:617–28. Riedel CH, et al. The importance of size: successful recanalization by intravenous thrombolysis in acute anterior stroke depends on thrombus length. Stroke 2011;42:1775–7. Prabhakaran S, et al. Acute stroke intervention: a systematic review. JAMA 2015;313:1451–62. Jovin TG, et al. Thrombectomy within 8 hours after symptom onset in ischemic stroke. N Engl J Med 2015;372:2296–306. Goyal M, et al. Randomized assessment of rapid endovascular treatment of ischemic stroke. N Engl J Med 2015;372:1019–30. Kernan WN, et al. Guidelines for the prevention of stroke in patients with stroke and transient ischemic attack: a guideline for healthcare professionals from the American Heart Association/American Stroke Association. Stroke 2014;45:2160–236. Heidbuchel H, et al. 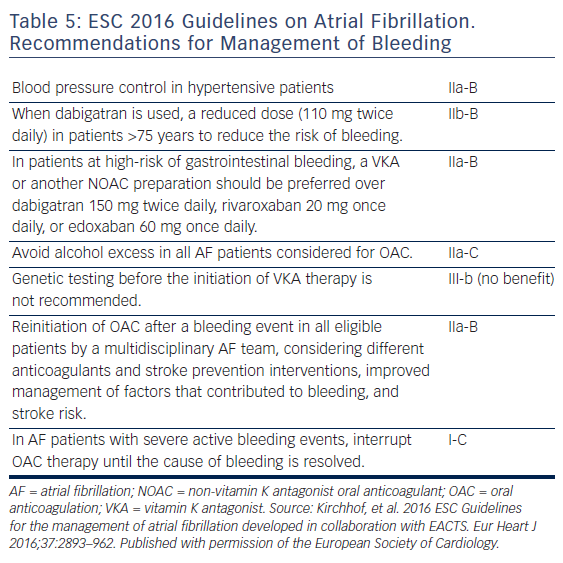 Updated European Heart Rhythm Association Practical Guide on the use of non-vitamin K antagonist anticoagulants in patients with non-valvular atrial fibrillation. Europace 2015;17:1467–507. Wang Y, et al. Clopidogrel With Aspirin in Acute Minor Stroke or Transient Ischemic Attack (CHANCE) Trial: One-Year Outcomes. Circulation 2015;132:40–6. Camm AJ, et al. 2012 focused update of the ESC Guidelines for the management of atrial fibrillation: an update of the 2010 ESC Guidelines for the management of atrial fibrillation. Developed with the special contribution of the European Heart Rhythm Association. Eur Heart J 2012;33:2719–47. Jorgensen ME, et al. Time elapsed after ischemic stroke and risk of adverse cardiovascular events and mortality following elective noncardiac surgery. JAMA 2014;312:269–77. Frontera JA, et al. 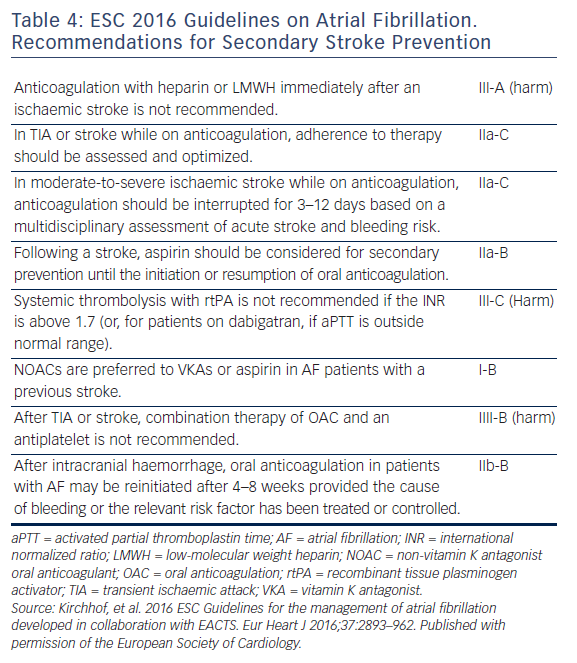 Guideline for Reversal of Antithrombotics in Intracranial Hemorrhage: Executive Summary. A Statement for Healthcare Professionals From the Neurocritical Care Society and the Society of Critical Care Medicine. Crit Care Med 2016;44:2251–7. Hemphill JC, 3rd, et al. 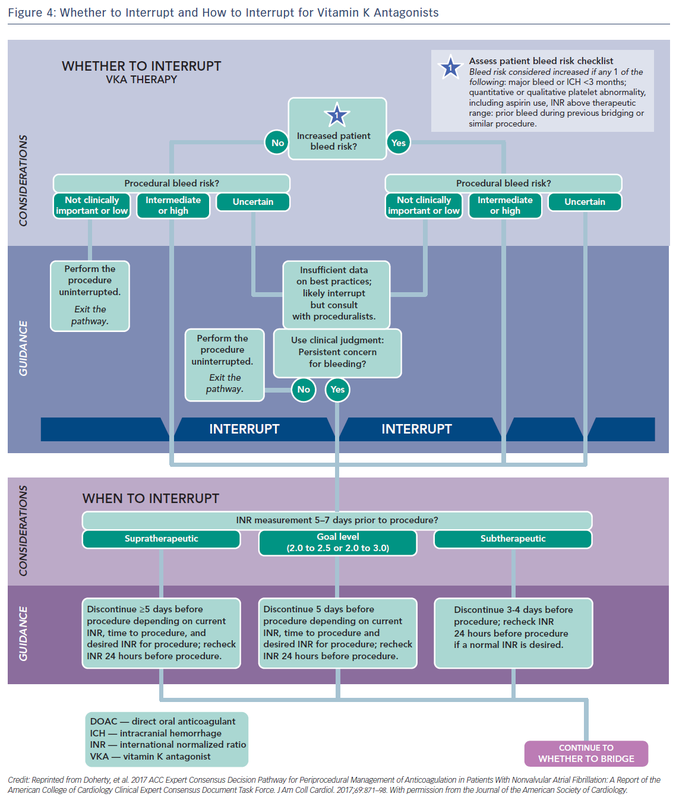 Guidelines for the Management of Spontaneous Intracerebral Hemorrhage: A Guideline for Healthcare Professionals From the American Heart Association/American Stroke Association. 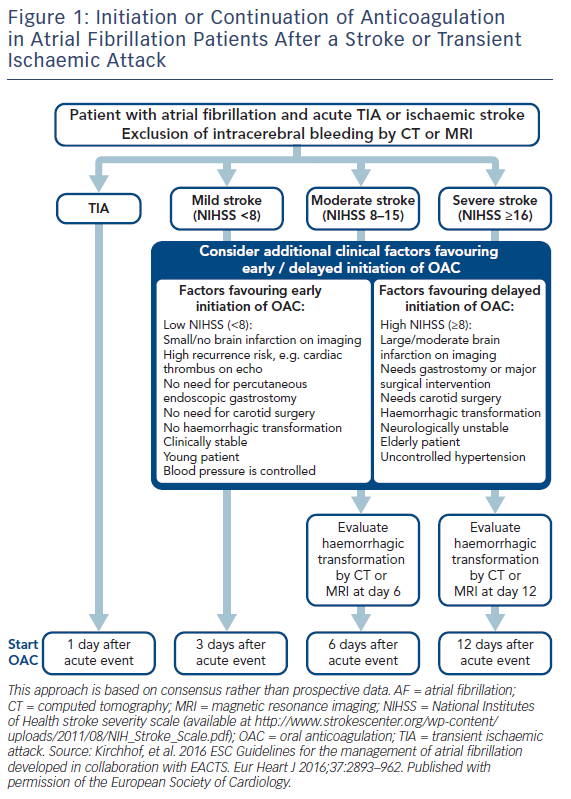 Stroke 2015;46:2032–60. Anderson CS, et al. Rapid blood-pressure lowering in patients with acute intracerebral hemorrhage. N Engl J Med 2013;368:2355–65. Kuramatsu JB, et al. Anticoagulant reversal, blood pressure levels, and anticoagulant resumption in patients with anticoagulation-related intracerebral hemorrhage. JAMA 2015;313:824–36. Nielsen PB, et al. Restarting Anticoagulant Treatment After Intracranial Hemorrhage in Patients With Atrial Fibrillation and the Impact on Recurrent Stroke, Mortality, and Bleeding: A Nationwide Cohort Study. Circulation 2015;132:517–25. Chao TF, et al. Use of oral anticoagulants for stroke prevention in patients with atrial fibrillation who have a history of intracranial hemorrhage. Circulation 2016;133:1540–7. Sengupta N, et al. The risks of thromboembolism vs. recurrent gastrointestinal bleeding after interruption of systemic anticoagulation in hospitalized inpatients with gastrointestinal bleeding: a prospective study. Am J Gastroenterol 2015;110:328–35. Doherty JU, et al. 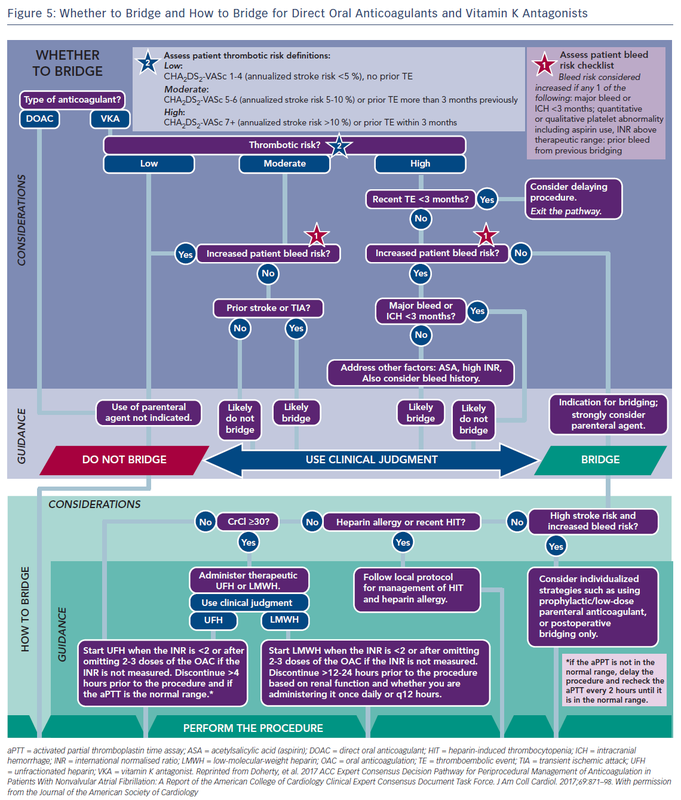 2017 ACC Expert Consensus Decision Pathway for Periprocedural Management of Anticoagulation in Patients With Nonvalvular Atrial Fibrillation: A Report of the American College of Cardiology Clinical Expert Consensus Document Task Force. J Am Coll Cardiol. 2017;69:871–98. Hickey M, et al. Outcomes of urgent warfarin reversal with frozen plasma versus prothrombin complex concentrate in the emergency department. Circulation 2013;128:360–64. Siegal D, et al. Periprocedural heparin bridging in patients receiving vitamin K antagonists: systematic review and meta-analysis of bleeding and thromboembolic rates. Circulation 2012;126:1630–9. Steinberg BA, et al. Use and outcomes associated with bridging during anticoagulation interruptions in patients with atrial fibrillation: findings from the Outcomes Registry for Better Informed Treatment of Atrial Fibrillation (ORBIT-AF). Circulation 2015;131:488–94. Birnie DH, et al. Pacemaker or defibrillator surgery without interruption of anticoagulation. N Engl J Med 2013;368:2084–93. Douketis JD, et al. Perioperative bridging anticoagulation in patients with atrial fibrillation. N Engl J Med 2015;373:823–33. Schulman S, et al. Perioperative Management of Dabigatran: A Prospective Cohort Study. Circulation 2015;132:167–73. Beyer-Westendorf J, et al. Peri-interventional management of novel oral anticoagulants in daily care: results from the prospective Dresden NOAC registry. Eur Heart J 2014;35:1888–96. Healey JS, et al. Periprocedural bleeding and thromboembolic events with dabigatran compared with warfarin: results from the Randomized Evaluation of Long-Term Anticoagulation Therapy (RE-LY) randomized trial. Circulation 2012;126:343–8. Patel MR, et al. Outcomes of discontinuing rivaroxaban compared with warfarin in patients with nonvalvular atrial fibrillation: analysis from the ROCKET AF trial (Rivaroxaban Once-Daily, Oral, Direct Factor Xa Inhibition Compared With Vitamin K Antagonism for Prevention of Stroke and Embolism Trial in Atrial Fibrillation). J Am Coll Cardiol 2013;61:651–8. Birnie DH, et al. 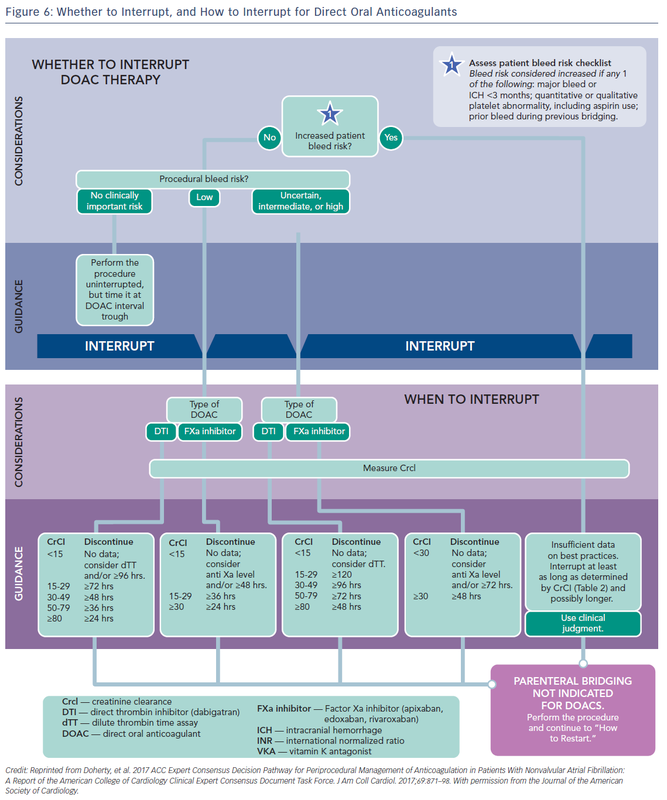 Management of anticoagulation around pacemaker and defibrillator surgery. Circulation 2014;129:2062–5. Sie P, et al. Surgery and invasive procedures in patients on long-term treatment with direct oral anticoagulants: thrombin or factor-Xa inhibitors. Recommendations of the Working Group on Perioperative Haemostasis and the French Study Group on Thrombosis and Haemostasis. Arch Cardiovasc Dis 2011;104:669–76. Powers W, et al. 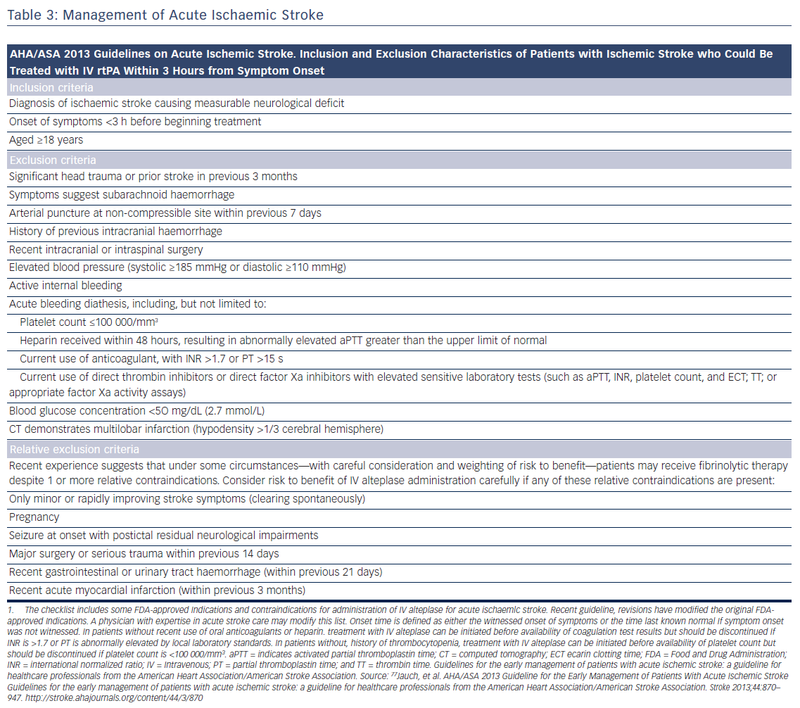 2015 American Heart Association/American Stroke Association Focused Update of the 2013 Guidelines for the Early Management of Patients With Acute Ischemic Stroke Regarding Endovascular Treatment: A Guideline for Healthcare Professionals From the American Heart Association/American Stroke Association. Stroke 2015;46(10):3020-35. Nishimura R, et al. 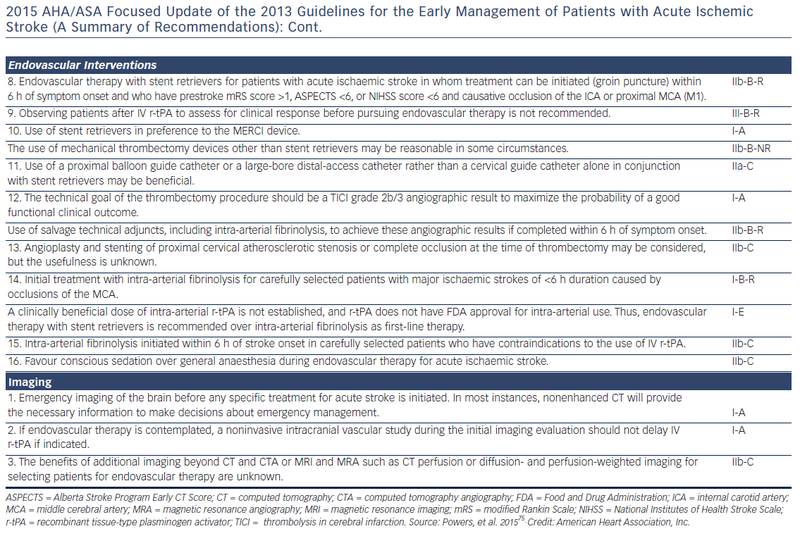 2017 AHA/ACC Focused Update of the 2014 AHA/ACC Guideline for the Management of Patients With Valvular Heart Disease. Circulation 2017;20;135(25):e1159-e1195.